Senator Rand Paul (R-KY) seemed amused but otherwise unfazed by New York Magazine’s characterizing him as Donald Trump’s ‘most loyal stooge.’ “Haters are gonna hate,” Paul said with smirk. 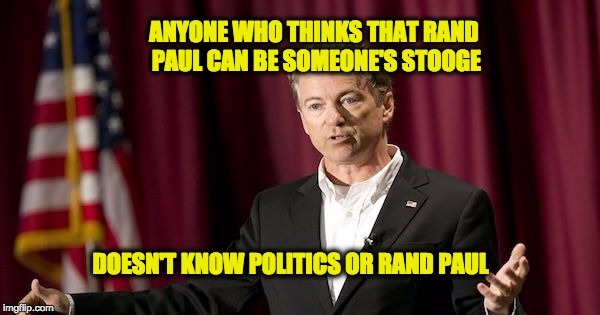 There’s a long list of things one can say about Paul, but there is no way the word stooge should be on that list.. We are talking about a man who did a filibuster the old fashioned way….he stood up and started talking and kept talking for thirteen hours. The junior senator from Kentucky, and onetime hope of the extremely short-lived “libertarian moment” in American politics, has not only attached himself to Trump, but is actively snuffing out whatever faint stirrings of opposition his colleagues can muster. Many Republicans have made piecemeal excuses not to exercise the oversight function. Only Paul has elevated the practice of looking away from the crimes of the Executive branch to an actual principle of governance. Senator Paul said that he’s obviously not Trump’s ‘most loyal stooge.’ In fact, he said that he’s probably the most independent Senator, as he’s worked with Republicans and Democrats on legislation. He said he’s not afraid to endorse conservative principles, and he’s not afraid to back the President when he’s right. He’s also not afraid to disagree with the President when he’s wrong. The conversation shifted to Obamacare. The Senator – unlike his party’s leadership – is still intent on fully repealing the Affordable Care Act and not replacing it with another ‘government program.’ It does need to be replaced, according to Paul, but with ‘market reforms’ designed to get healthcare costs to come down. Paul mentioned that the ‘death spiral’ that Obamacare is in right now is caused by the idea that pre-existing conditions must be covered by insurance companies. So, the market ends up being flooded with people who are already sick, which drives costs way up, because the young and healthy aren’t buying insurance. The insurance market depends on healthy people paying premiums.